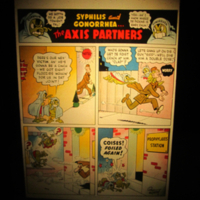 "I Know All About Women"
"Syphilis and Gonorrhea...the Axis Partners"
This poster shows an image of a scientist in a lab and a microscopic view of syphilis microbes. 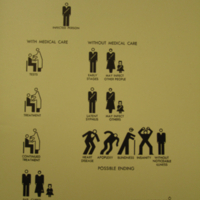 It also explains the long-term effects of the illness and the effectiveness of early treatment. 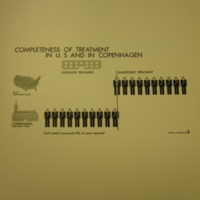 "Completeness of Treatment in U.S. and in Copenhagen"
This infographic contrasts the rates of adequate treatment in the US and Copenhagen, which are approximately 5% and over 90% respectively. 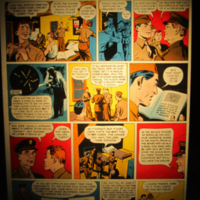 It is a graphic print for an image that appeared in Parran's 1937 book, Shadow on the Land. 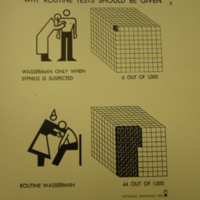 "The Infected Person May Choose"
This pictorial statistic contrasts the progression of syphilis in a person who seeks medical care and one who does not. 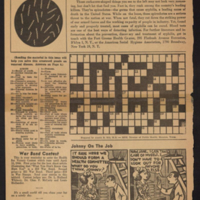 It is a graphic print for an image that appeared in Parran's 1937 book, Shadow on the Land. 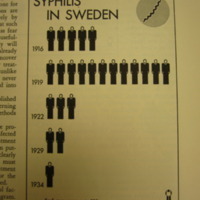 "Why Routine Tests Should Be Given"
"Outcome of Latent Untreated Syphilis During Pregnancy"
"Cases of Syphilis Traced to One Person in One Year"
"Syphilis in New York State, Syphilis in Scandinavia"
This pictorial statistic shows syphilis atop a list of health threats including scarlet fever, TB, auto accidents, and diphtheria. It is a graphic print for an image that appeared in Parran's 1937 book, Shadow on the Land. 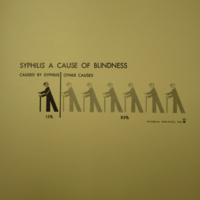 "Syphilis A Cause of Blindness"
This pictorial statistic conveys that syphilis is responsible for 15% of cases of blindness. It repeats the symbol of a blind man to represent the statistic. It is a graphic print for an image that appeared in Parran's 1937 book, Shadow on the Land. 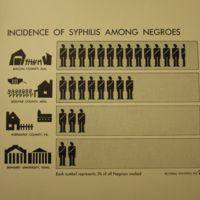 "Incidence of Syphilis Among Negroes"
This is a page from a health newsletter created for workers by a industrial health program in Fort Greene, an area in Brooklyn, NY. 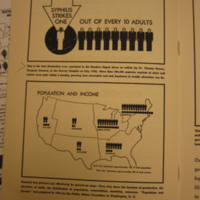 Each issue focused on different health issue. 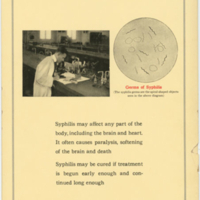 Two of the issues this year were on syphilis. This film documents a mobile trailer clinic program. 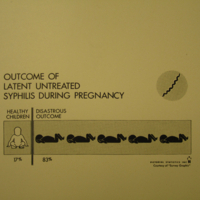 Though the program only served African Americans in rural Georgia, it is highlighted as a success in syphilis control that could be applied to any population in any part of the nation. 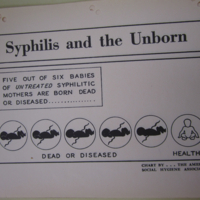 "Five out of six babies of untreated syphilitic mothers are born dead or diseased." 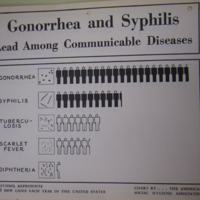 "Gonorrhea and Syphilis Lead Among Communicable Diseases"
This infographic conveys that there are more new cases of syphilis and gonorrhea each year compared to other infectious diseases. 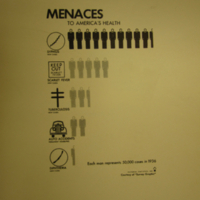 This is a reproduction of the 1/10 infographic originally from the Reader's Digest and Survey Graphic articles by Parran. 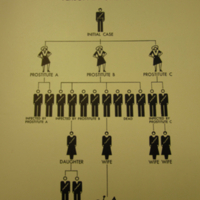 Here it is included in a pamphlet by Pictorial Statistics, Inc. to highlight their work and the effectiveness of infographics. 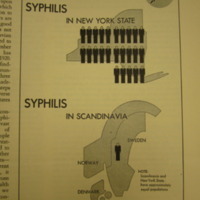 This pictorial statistic compares the incidence of syphilis in New York and Scandinavia. Even though the two areas have approximately equal populations, New York has 50,000 new cases annually, while Norway, Sweden, and Denmark only have about 2,000.